The third finger SCUBA diving site on the south jetty of Yaquina Bay at Newport, Oregon is a great place to go spearfishing for perch, lingcod, and rockfish. We also love going crabbing here. Red rock crabs are always plentiful and at certain times of the year, dungeness are in abundance. For nature lovers who prefer to hunt for photos of micro life, we have seen many nudibranchs, hermit crabs, and other small creatures crawling along on the rocks. There is something for everyone at this site if you are willing to climb over the jetty rocks and put up with some surge at the entrance and current at the tip of the finger. When the fifth and fourth fingers are too rough to dive, sometimes the third finger is still an acceptable dive site. Looking toward the Yaquina Bay Bridge at the South Jetty in Newport next to the third finger. This is a great site to do crabbing and is less rough than the fifth and fourth fingers in stormy conditions. Being further in the bay means that visibility is not as good as the dive sites further toward the ocean. The main highlight of the third finger dive site is the marine life. The third finger is the second longest finger out of the five (the first finger is the longest). We have found many different species of rockfish here. There are several species of nudibranchs present. Both red rock and dungeness crabs are plentiful (be sure to check current crabbing regulations). We have gone spearfishing for lingcod and perch here, and have found both in abundance. This site is a good longer dive in Newport that always has something new to see or experience. We have never been disappointed diving the third finger although visibility on days with small tide swings aren’t as good as out on the fourth and fifth fingers. Take the exit for the aquarium off of US 101. Turn onto Southwest Jetty Way and head toward the ocean. The dive site is on the north side of the road right when the trees give way to an open brush-filled field on the left. Ample parking is available around this site. Park anywhere off the road where others have parked before. On the south side of the road, a fence prevents parking near this site but we have never had trouble finding parking on the north side of the road around the jetty. Ample parking and a great site for underwater hunting or observing life on the rocks makes this a popular dive site. The third finger roughly runs north-south from the roughly east-west jetty. You know that you have reached the end of the third finger when the jetty rocks give way to open water and a sandy bottom. You will also most likely encounter the current at the tip of the third finger running into or out of the bay. The jetty north and south of the third finger often has crabs on it and can be a useful hunting ground. Note that the third finger has significant kelp and seaweed on the top of the rocks. An entanglement hazard exists because of this. Taking a good dive knife along is recommended. We have several dive knives that we prefer and use when diving in Oregon. 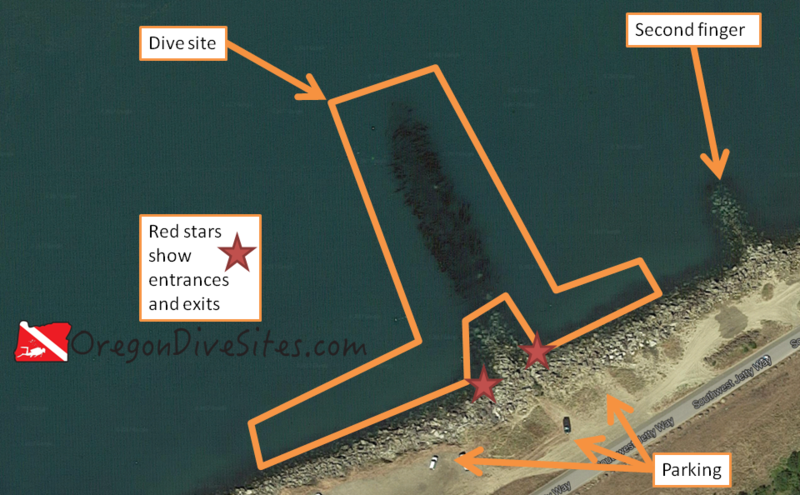 While the south jetty can be crossed anywhere along the jetty structure, we have found that the best places to enter and exit for SCUBA divers on the third finger is on either side of the base of the third finger. Crossing over jetty rocks is difficult and physically strenuous. Before you gear up, we suggest walking the entrance to find the route that you want to use. We have encountered both surf and surge at the entrances on the third finger. The conditions usually aren’t as rough as on the fourth and fifth fingers but both surf and surge may be present. This is a shore dive although a competent boat captain could bring divers to the tip of the third finger. Due to the current and shipping channel traffic, it is difficult for a boat captain to maintain position and pick divers up on the third finger. Conditions at the third finger are usually favorable for Oregon SCUBA divers. There usually is a little surge at the entrance/exit and occasionally there is some surf if there is a big storm rolling in off the ocean. We have often encountered recreational anglers and crabbers both fishing from shore and from small boats on the third finger. Be sure to carry line cutters in case you get tangled in fishing line. It is also useful to carry a flashlight to peer into the many cervices and caves in the jetty rocks. We have several SCUBA dive lights that we recommend on our Gear We use page. Visibility on the third finger can vary between 15-20 feet and 3-5 feet depending on the size of the tidal exchange, time of year, and if a storm is brewing in the ocean. The best time to dive this site is at high tide when visibility is the best. The bottom is sandy. Bashing into the bottom, as we have done when wrestling with a red rock crab, does not screw up the viz. 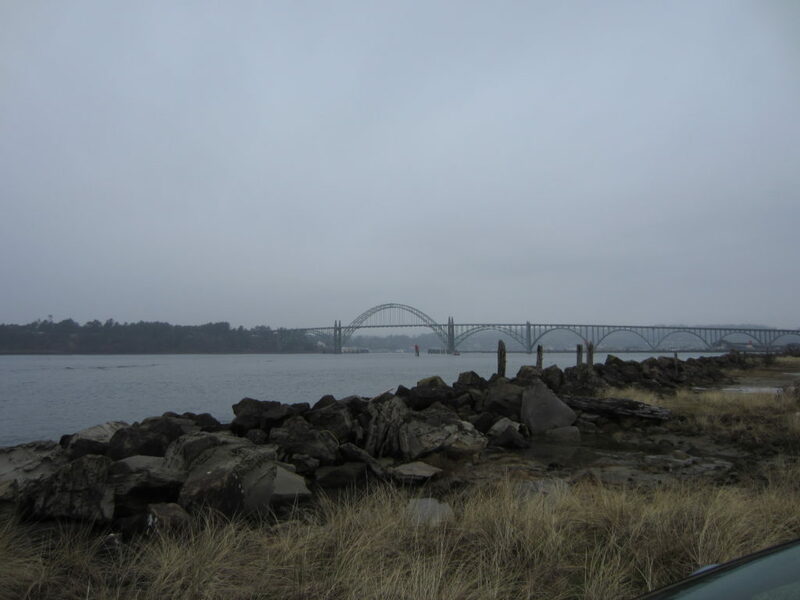 Water temperature can vary based on the time of year and water flow out of the Yaquina River between 42F and 52F. Usually we have found the water temperature to be about 45-46F. This site can be dived year round but we prefer diving here in the fall or spring. Check local fishing and crabbing regulations to determine the best time of year to go spearfishing or crabbing here. We have hit 38 feet at high tide at the end of the third finger. Most of the site is shallower than this with the bottom along the jetty being at around 15-20 feet. Good control of neutral buoyancy is key in shallow water. While we know open water divers who have gone diving here successfully after receiving their certification cards. However, the additional skills and confidence gained in an advanced open water course will give new SCUBA divers more confidence in diving this site. As always, only dive this site if you are confident in your skills and the conditions are acceptable to you. We rate this dive as an intermediate dive because of the difficulty of the entrance and exit. If you can get the closest parking (usually you can), you have to climb over about 50 feet of jetty rocks to reach the dive site. We highly recommend diving this site at high tide for the best visibility. In stormy conditions, this site may not be diveable. At low tide, visibility is greatly decreased and the dive becomes very shallow. The current at the tip of the third finger can really rip on either side of slack tide. Be aware and be prepared to deal with the current as you round the tip. If you get carried away from the third finger, you may end up out in the ocean. Swim due south when in doubt! There is a local dive shop in the South Beach area of Newport that provides air fills, can service gear, and carries a limited selection of gear. Both the south and north bayfronts in Newport have many great restaurants. Any of them make a good place to stop into after diving the third finger. The South Beach State Park campground is a good place to camp. 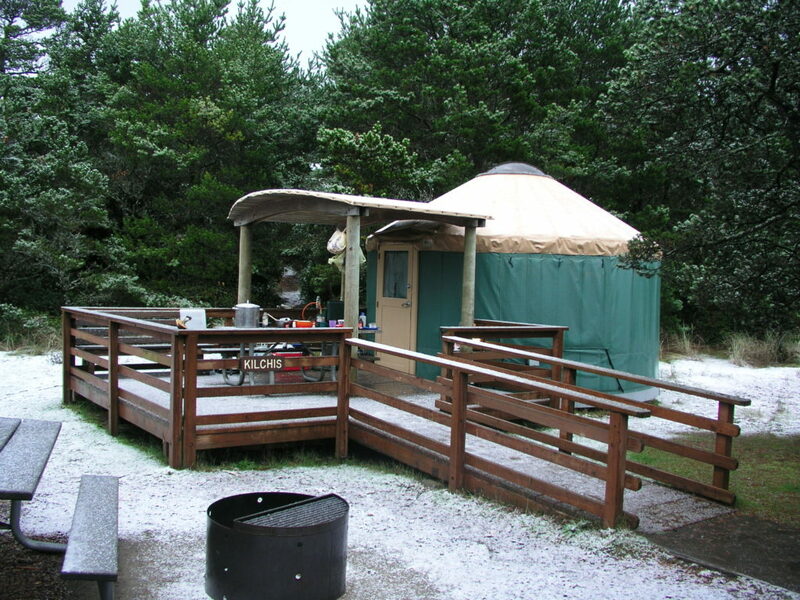 Yurts are also available for rent. We have stayed in the yurts before and can recommend them. We have not tried any of the hotels in Newport but please let us know if you have and can recommend one for fellow Oregon divers.